Our miniature orchid theme continues with the smallest Epidendrum species we grow. The whole plant here is 3cm across and the tiny growths finish in two or three flowers about 8mm across which flower successively over quite a long period. 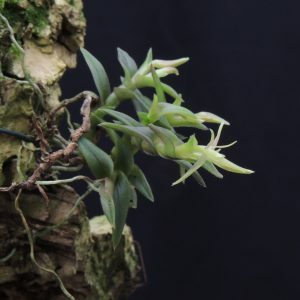 Epidendrum nanum (meaning the tiny epidendrum)has been reported from wet forests in Peru and Bolivia from 600-2300m and we find that the species prefers a cool spot in heavy shade in our Cool Americas Section. Like most of our mini-miniatures we grow this species mounted to really enjoy the whole plant in growth and because we find little plants do best on mounts and away from competition. This is another new species for 365 days and it is a delight for us that we can share such wonderful diversity from our greenhouses and this extraordinary plant family. I think the best way to see this orchid is in a really close up photograph. In real life it is so tiny it is difficult to see it! A truly amazing little orchid.